It's been almost six months since my last post. If you follow me elsewhere, you'll see that I'm active as ever, just in bite size portions. But I miss writing more, so here I am. It's been a busy six months between the holiday season that followed my last update and non-stop day job action since the New Year. I've been thinking a lot lately about my "creative generalism" in the tiny sliver of time not consumed by work or family, and the seemingly endless quest to re-brand, so to speak, all that I do and all that I'm interested in without necessarily specializing in any one of those things. It's tricky. I'm cautiously optimistic that summer will provide a slight respite from the hectic pace of the last half-year, allowing me more time to work out some of my longer-term creative ideas here and elsewhere. In the meantime, today is National Licorice Day! As you may be aware, random holidays, usually celebrating food, provide me with a fair amount of inspiration these days, both when writing about where I live and when thinking up weekly adventures for a particular felt tardigrade duo. 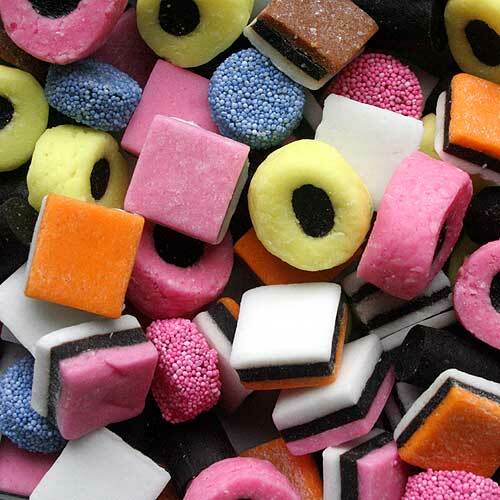 Whenever I think of licorice, I think of Allsorts, the perk of weekend trips to the UK's equivalent of Home Depot when my family lived in England, circa 8th grade until about halfway through my sophomore year of high school. We owned the house we lived in "off base" in the town of Bedford and it was a bit of a fixer-upper. I could write about how it was a good experience in some way, in hindsight, helping out with projects around the house during my formative years, but mostly what I remember is happily adding a bag of Allsorts to the caulking and the backyard tiles upon check-out, a sweet ending to an otherwise pretty boring weekend outing.